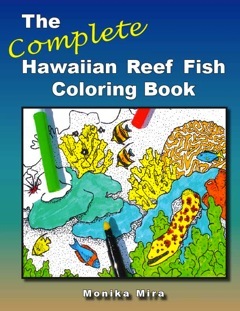 The Complete Hawaiian Reef Fish Coloring Book includes over 200 colorable illustrations to help the reader learn to identify over 80 species of fish. Each illustration is accompanied by a complete description of the fish, including the scientific, common and Hawaiian names. Their anatomical features, coloration, body designs, feeding habits and reproductive strategies are also explained in a fully illustrated section devoted to these topics. In addition, an overview of coral reef ecology is provided to help the reader understand the relationship between the fishes and the coral reef and the importance of conservation. The Earth Friendly Edition is now printed on recycled paper to better reflect the author and publisher’s environmental philosophy. Winner of the Dr. Toy Best Children’s Vacation Products Award for summer 2010 and the Creative Child Magazine 2010 Book of the Year Award for its category.